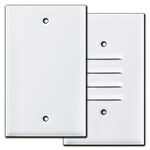 Buy quality classic white switch plate covers in 400+ sizes - toggle, outlet, Decora, oversized, narrow - all made in USA. 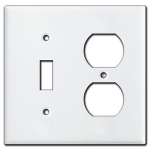 See examples of white plates with electrical devices below. 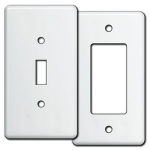 Find the the good looks and durability you want in a great selection of high-quality white metal switch plate covers - white toggle, outlet, Decora rocker, GFCI receptacle covers, white oversized or combo wall plate configurations as well as narrow, deep and short options, all made in USA. 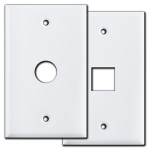 Create a clean look with white enamel switch plates that coordinate with your home's tile, crown molding, and appliances. 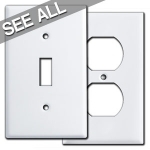 Buy all the sizes you need in one place - standard sized plates for any room, narrow wallplates to fit beside a cabinet, oversized plates to cover up mistakes, and hard-to-find combinations in 2-gang, 3-gang and higher (up to 10 gang). 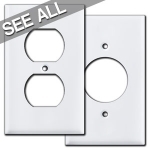 White switchplates feature a smooth, semi-gloss baked powder-paint enamel finish on durable .030" steel plates that looks great with either gloss or satin white switches and receptacles to make it easy to complete your lighting project. You'll find over 350 standard and hard-to-find sizes so you'll be able to add a fresh, bright look to any room of your home or business. My home is decorated with distressed furniture, antiques and shabby chic accessories. 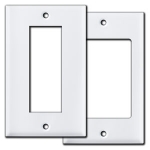 Which switch plate finish would blend in nicely with my decor? 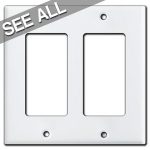 Our extensive collection of white metal switchplates would be the best choice for any one who decorates in the shabby chic style. They are also a great match for those who decorate in an English Country, Scandinavian, Americana, Nautical or Modern look. I'm worried about white wall plates because my last ones yellowed and cracked. Are these plates more durable and can I install them in any room I'd like? If your previous switch covers were plastic, those do tend to crack and yellow over time. 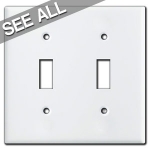 Our white wallplates are made to stand the test of time and are extremely dependable as well as easy to clean. They can be installed anywhere in your home including your bedroom, entry way, sun room, kitchen, bathroom, garage, game room, office or laundry room. 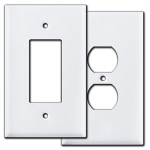 Would these switch plate outlet covers work well in my beach cottage? Absolutely. 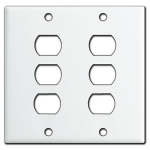 These white switch plates will compliment interior spaces in beach homes, nurseries, bridal stores and upscale boutiques.